Sneak around the battlefield and snipe your enemies in tank destroyers this week to earn epic rewards with our daily missions. Don't miss out on renting the terrifying yet delicate M56 Scorpion tank destroyer. Then, move onto bigger Credits with the rental of the WZ-111 Chinese heavy tank. Try 'em before you buy 'em -- both vehicles available in the Premium Shop until March 25! Plus, participate in the TD Throwdown 1v1 tournament for the chance to win Gold! 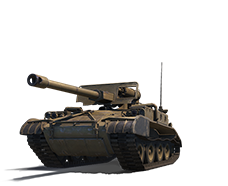 If you earn 20,000 XP each day over any number of battles in a vehicle of tier V or higher you'll unlock the M56 Scorpion for 24 hours. If you earn 5,000 XP each day over any number of battles in the M56 Scorpion you'll unlock the WZ-111 for 24 hours. Earn 4,000 XP over any number of battles. Play a battle and destroy two (2) enemy tank destroyers. Earn 5,000 XP over any number of battles. Play a battle and place in your team's top 3 damage dealers. Earn 6,000 XP over any number of battles.